I've promised not just to flack my titles on this page, but I did say I was going to tell you about them now and again. That's what makes you publish a book--the urge to share it with other readers. The one that's on my mind today is The Union of Their Dreams by Miriam Pawel. The Los Angeles Times reviews it this coming Sunday and calls it a "masterpiece." I agree. It reminds me of classics like Anthony Lukas’s COMMON GROUND, or Randy Shilts’ AND THE BAND PLAYED ON in the way it weaves a narrative from the stories of ordinary people that you come to care about intensely. 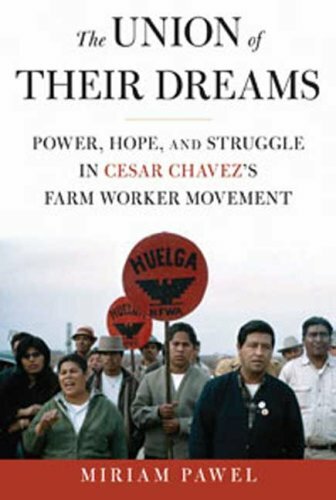 The story of Cesar Chavez and the United Farm Workers is one of the great American struggles for social justice, an astonishingly successful movement built from scratch. Miriam tells it through the experience of eight people who became key players in the UFW, from workers who learned organizing in the fields, to idealistic lawyers, ministers, and college kids. They found meaning and passion in "The Cause," and did incredible things, including leading the most effective consumer boycotts in history. What's On Your Shame List? Robert Gray, the bookseller who writes one of the most astute and engaging blogs in the book trade, has a wonderful post this week at Shelf Awareness on "The Shame List." The Shame List includes "those backlist books every bookstore would be 'embarrassed' and even 'mortified' not to have in stock when a customer asks for them." He lists a few titles--some you might not expect--that are on his personal shortlist of books he'd hand-sell without even looking at the shelf. And he asks readers what titles are on their own Shame Lists. I can’t remember where I saw this, but I once read a piece by an author about her “Middlemarch test.” If she went into a bookstore and it didn’t have Middlemarch, she knew the place was not up to scratch. Maybe that’s setting the bar too low, but I would certainly agree that if there’s no Middlemarch the backlist pickings are going to be slim. Welcome. Having dipped a couple of toes in the Twitterstream, I'm taking a further plunge here. It's surprising to me that while there are scores of excellent blogs that comment on books, writing, and the publishing industry, only a few are written by publishers and editors themselves. It also makes me a little nervous--what do they know that I don't? If I think about this too much longer I'll talk myself out of it so I had better type fast and hit Publish. rhapsodize about the mysteries of writing or the thrill of “discovering a new voice"
Talk candidly about what goes on in a publishing house from one editor's point of view. And probably I'll occasionally pass on a completely random link like this.